…how to correctly open and close sliding doors, how to walk on tatami, how to enter and exit the tea room, how to bow and to whom and when to do so, how to wash, store and care for the various equipment, how to fold the fukusa, how to ritually clean tea equipment, and how to wash and fold chakin. As they master these essential steps, students are also taught how to behave as a guest at tea ceremonies: the correct words to say, how to handle bowls, how to drink tea and eat sweets, how to use paper and sweet-picks, and myriad other details. This Monday morning I am permitted to observe two students in their kimonos and obis, as they rehearse some of the meticulous movements that make up the ritual. They have been studying tea with Shun for 2 ½ months and are just at the beginning. Today they struggle with one of the most challenging steps, folding the fukusa just so. The small orange cloth is tucked discretely in their kimonos and used for the ritual cleansing of the tea-scoop and tea-caddy. It is exacting work and at one point they need to yank the cloth taut to produce a resounding snap. I am seated on a stool outside the tiny room, ideally sized for 3-4 people. 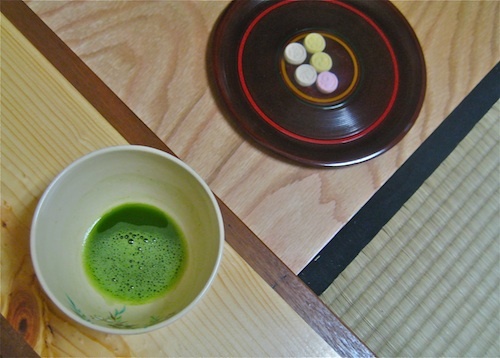 But I am also included as a guest in the ritual and offered a plate of okashi (sweets) to eat first and a bowl of strong frothy cha green tea to follow. I feel privileged to share this moment of tranquility. 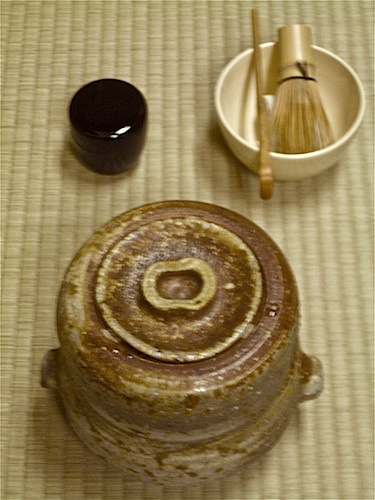 This entry was posted in Japan and tagged Itsy Bitsy, Japanese Tea Ceremony, Shun Yang, the way of tea. Bookmark the permalink. How cool! I have bought earrings at Itsy Bitsy for years and didn’t know about this. I emailed this to the folks at JMSG — theought maybe they could connect with her for the 7th grade Japanese culture curriculum unit. Thanks Ilana, yes, the tearoom is new, just constructed in Sept. Great idea about JSMG. Shun is a lovely person, not sure if she ever waited on you when you bought earrings there. My experience is that she really gives customers 100% attention, no matter if they end up buying a $10 pair of earrings or nothing at all. Now I am guessing that her approach may come from her long practice of tea and the concentration on each moment and encounter. Anna, Thank you for sharing this. 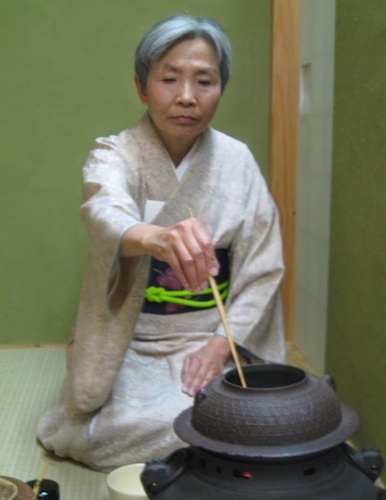 I’ve been looking for a good tea sensei in the Bay Area — I studied tea ceremony with my cousin, who’s a tea sensei, when I lived in Hiroshima for a year — and will have to check this out. It’s been 10 years since I studied the way of tea so I’ll have to go back to the beginning! I am happy to meet you. Shun is a very patient teacher. I hope this works out for you. P.S. Check out the great earrings while you are there.